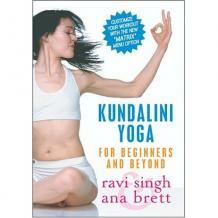 Kundalini Yoga for Beginners & Beyond - "Now with the Matrix!" Kundalini Yoga is the fitness of the future! This powerful yoga technology includes everything you need to reshape your body and your life! This effective daily maintenance workout features two 25 minute sets which can be done individually or together. Set 1, Rise & Spine, will help you maintain a healthy back and raise your energy high! Set 2 features the 'Five Tibetans,' exercises to keep you supple, youthful and vital for life! Also included: meditation and deep relaxation. Discover why Ravi & Ana's client lists includes Madonna, Donna Karan, Gwyneth Paltrow, and the Red Hot Chile Peppers. This conveniently chaptered DVD has everything you need to give your life a total boost! Total Running Time: 65 min.